Poem by William Blake 1757-1827 "Tiger"
In case any members of "Generation X" have stumbled over my offering of Dec 28th, I should clarify that the references to "burning bright" and "in the forests of the night" are allusions to this poem by William Blake. Jemi and I visited Ranthambore, in Rajastan. India in mid-December. I last visited there nearly twenty years ago. 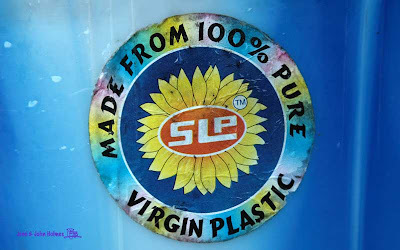 It goes without saying that, in a fast-changing country like India, things had changed a lot. There are now many hotels built to cater for "Tiger Tourism", and 90% of the visitors are domestic tourists. So money is being made from wildlife and Indians are taking time to appreciate their natural heritage, which has got to be positive news. However, you'll find you are sharing the reserve with a lot more people than used to be the case. 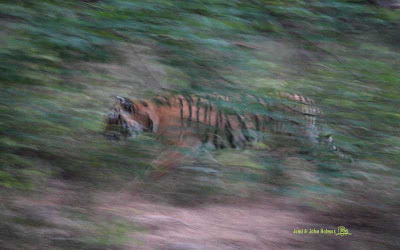 They now divide Ranthambore into five circuits (Max. 8 vehicles each). 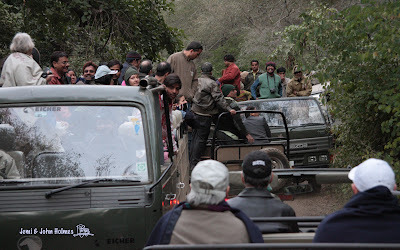 When a Tiger is spotted just outside the reserve at dusk as people are leaving, as happened when we were there, everyone positions themselves along the road, hoping to be in the best viewing spot when the Tiger crosses the road. And what was all the fuss about ? 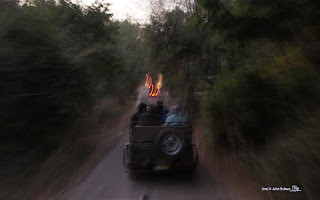 We were just two more touroids at Ranthambore, Rajastan, India, earlier this month..... Thanks to the experience of our guide, though, we just managed a glimpse of this one "in the forests of the night". The camera was set at ISO 1600 and shutter speed about one sixth of a second. With film I'd have got nothing at all. 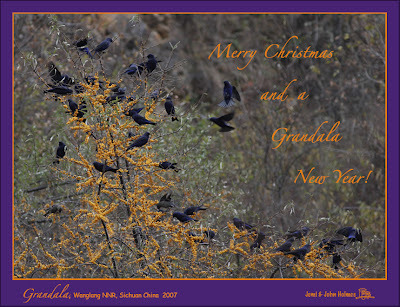 Merry Christmas & a Grandala New Year!